Ed Sheeran's new album has become one of the fastest-selling releases ever in the UK, shifting 432,000 copies in just three days. 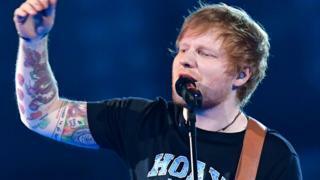 Sheeran's third album, titled ÷ (Divide), has become a monster hit since its release on Friday. The all-time list for first-week sales has Adele's 25 and Oasis's Be Here Now at the top with 800,000 each. If Sheeran doesn't quite match them, he could go third on that list, above Take That's Progress, which sold 518,601. The album sold more copies in its first day (232,000) than any album did in a week in 2016. David Bowie's Blackstar had the highest one-week sales last year with 143,455. All 16 tracks are due to enter the top 40 when the new singles chart is announced on Friday, according to midweek sales figures published by the Official Charts Company. Of the 432,000 sales, 63% were on CD and vinyl, 31% were downloads and 6% were "streaming equivalent sales" - an estimate of how streaming figures equate to sales. ÷ smashed the Spotify record for the most-streamed album in a single day - notching up 56.7 million streams on its day of release. ÷ is also expected to have the biggest first-week sales of the year so far in the US, according to Billboard. Sheeran has said he wants to challenge Adele's album sales. "Adele is the one person who's sold more records than me in the past 10 years," he told GQ. "She's the only person I need to sell more records than. That's a big feat because her last album sold 20 million. But if I don't set her as the benchmark then I'm selling myself short." His album has already exceeded expectations. Before the release, Sheeran's manager Stuart Camp told Music Week he would be "ecstatic" with first-week figures of 350,000. But he added: "But really I'm thinking, what will we have sold by the end of 2018? It's about the long game." The final chart and first-week sales figures will be revealed on Friday.